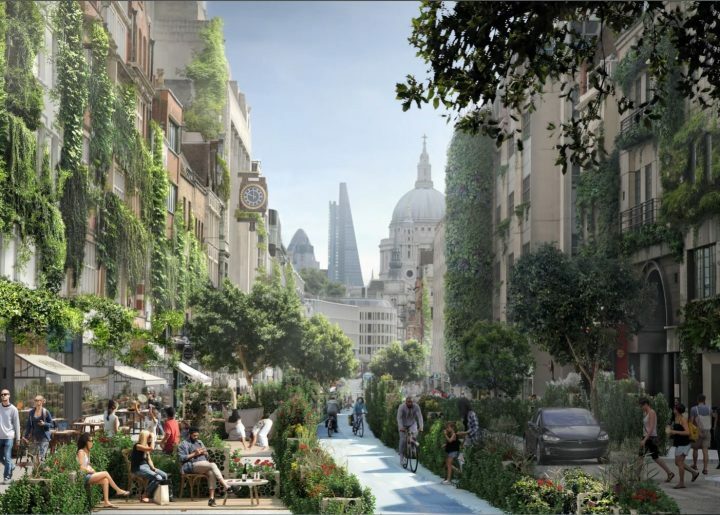 This October 10th, the London office of WATG released this image of a ‘greener future’ for London’s Fleet Street in support of the ongoing proposal to make London a ‘National Park City’. Dan Raven-Ellison, the proposal’s key protagonist, has a flair for PR and has effectively repackaged the worthy, but duller-sounding project to improve London’s green infrastructure (worthy, but dull) through the All London Green Grid (ditto). Just to show how much beneath notice all this earnest work was, the Mayor of London, Sadiq Khan, announced his support for the National Park City (NPC) idea despite the fact that the All London Green Grid (ALGG) had been in development since Ken Livingstone was in office, and is already in place as Supplementary Planning Guidance. Granted, the National Park City initiative overwrites the whole conception of the city: the ALGG is about creating green space in the city and for the city, while the NPC is about making the whole city green, or at least this is I think what its message is. There is, indeed, great value in conceiving of the city as a landscape, especially because that is what it is, whether green or not. London, like all landscapes, is made collectively by people, and it also shapes its inhabitants. Because a landscape is shared, it cannot simply be thought of as parcels of property. So why am I so disturbed by the WATG’s image? Is it not churlish of me to object to something that is “designed for visualisation and conceptual purposes only”? Actually that’s already part of the problem. London is still reeling from the vast waste of public money perpetrated by another totemic visualisation, that of the Garden Bridge, which is thankfully now defunct. Visualisations have immense power to shape expectations, and this image is raising some false ones. It has clearly been constructed to show the maximum possible use of street space and building envelopes to accommodate greenery. That, however, is a drastically oversimplified project. Cities provide us with a vast range of goods, from industry to entertainment to education and more. They provide general togetherness and proximity to one another. They give us things to do, including work. Cities also need to be maintained. Most of the things we like about cities, especially if they’re well-maintained, require big, heavy vehicles that could possibly be downsized, but not by much. Those vehicles require infrastructure that is decidedly grey rather than green. Like many, I think the city would benefit from containing fewer cars, and from vehicles better designed for the city, but cities will still need to be served everywhere by vehicles, and by industry where it’s needed, not exiled to the margins. That’s the first false expectation, that we can wish vehicles away, or do everything by bicycle, and the second is that the ‘green’ city could or should resemble a garden. There’s plenty of outdoor seating shown in the image. While it’s nice to sit out on the street, it’s not always a good thing. It can make sidewalks difficult to negotiate, it often encourages the use of deeply unsustainable patio heaters, and it expands restaurant floor areas, which might lead landlords to raise rents based upon capitalising upon public space as additional floor space. While a heavily planted streetscape might look appealing, it creates more obstacles for the blind and partially sighted and for wheelchair users. Wheelchair users, in particular, can become trapped in the space of the street by high curbs or planters. Greening of streets diverts our attention from improving existing green open spaces, which are desperately underfunded and neglected due to austerity–especially in the rest of Britain outside London. Property developers are always looking for excuses to build on open space. If streets are like parks, then who needs other open spaces? Extensive use of containers for planting requires extensive irrigation, and uses large quantities of potting mix, which often contains unsustainable peat. The urge to create clickbait for papers like the Evening Standard can be overwhelming, and the creators of this illustration have succumbed. It’s not that we don’t need to envision what a greener city might look like. We do! Very much! But those visions need to value the city for all its goods, even the tough, messy, dirty (often fun) ones created by work. Suburbanising the city in the way that this image does empties it of much of its vital meaning and purpose.